Embarrassingly I did not post to The Accretionary Wedge centered on Deskcrops. I have some lame-o excuse, but that's all it is. So, belatedly, here is the next installment of my deskcrops. As an undergraduate I was the beneficiary of an amazing alignment of geologic planets. My first year as a major (sophomore year) was also the first year a new professor was teaching at TMLAC. He happened to be a co-PI on a large NSF funded project, and had included funding for undergraduate research in his portion of the proposal. I turned out to be a good student, and for two summers (after sophomore and junior year) was able to do field work with him, and an excellent cast of high-falootin' geologists in northwest British Columbia. It was really an amazing experience for me. The first summer I went from school ending, to a 2-week geology field trip in the northeast, to 6 weeks of field camp, and then straight to British Columbia. Incidentally, that summer I spent all but 2 weeks total living out of tents and sleeping bags. It was awesome. My main project, what later became my senior thesis, focused on a large tonalitic pluton near the town of Prince Rupert. I was mapping the contact, and looking at variations in the magmatic fabric of the pluton as it related to a major bounding structure. The thesis is embarrassing to read now, but it did end up as a talk at GSA my senior year (Salt Lake City, 1997.) Anyways, even though I was mainly looking and sampling the tonalites, we did venture into the country rock every now and then. The sample above is one of my favorites. This is one of many chunks I brought back, although I've never seen it in place. This particular chunk was whacked from a big piece of float while waiting for the helicopter to come and pick us up. Yes, perhaps the coolest thing about the field work was that we got to use helicopters, not typically for day trips, but we'd get flown in and left for a few weeks of field work, then picked up and given a few days to shower and get away from the black flies (and hit Cowpuccino's). I digress, back to the deskcrop. 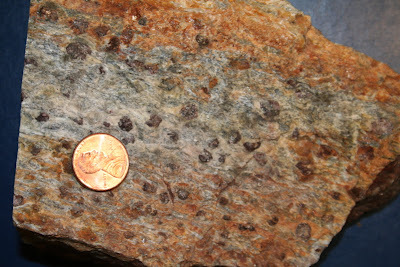 This is a piece of the country rock, a garnet-sillimanite gneiss. How much sillimanite you ask? Well, roughly 70%. I basically see this rock as a metamorphosed beer can, the amount of aluminum is really astounding. I was on a field trip to the Funeral Mountains in Death Valley where one of the big stops was where we could see sillimanite (you can, in Monarch Canyon, walk from a brittle detachment fault into sillimanite grade schists and gneisses.) When we got to the outcrop, I was a tad unimpressed. The sillimanite we spent the afternoon hiking to occurred as fuzzy growths on biotite, something you needed a hand lens to see. Previous to this my entire field experience with sillimanite was where it was the dominant mineral in the rock. I have since learned to appreciate all forms of sillimanite, but this is still my favorite. I have yet to find many reference for this rock, although it is kind of famous among the people who work up there. There was one outcrop that was mapped and sampled just prior to being blasted away to make a road, but other than that it has only been found as float. As such, I cannot provide much insight into it's geologic significance, but I have about 15 pounds of it in my office. Sillimanite is very cool; I haven't seen any since I came west in the late Holocene. Wish I'd saved some when I was schooling in New Hampshire.